What is taking the grand jury so long in Ferguson, MO? Some reports indicate that we could be defrosting our Thanksgiving turkeys before the grand jury announces whether or not it will charge officer Darren Wilson in the shooting death of Michael Brown on August 9th. That will be over three months. If the jury is hoping tensions will ease during this unfortunately long waiting time, they are wrong. Two police officers were shot over the weekend and seven protesters were arrested in an unrelated incident. Even if these recent activities are not a direct result of the Brown shooting, they are obviously indicative of the growing feeling of unease between the police and the mostly black residents of Ferguson, MO. Meanwhile, Darren Wilson remains a free man, and his fan club is growing. 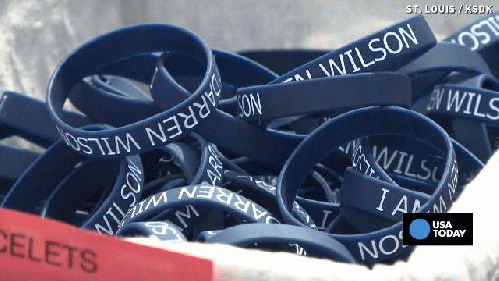 Recently, a police officer was ordered to remove his "I am Darren Wilson" wristband -- for obvious reasons. "Federal officials intervened Friday to stop police in Ferguson, Mo., from wearing 'I am Darren Wilson' bracelets in solidarity with the police officer who fatally shot an unarmed black 18-year-old there last month. Ferguson Police Chief Tom Jackson agreed to bar his officers from wearing the bracelets while in uniform and on duty, and to ensure that other local police agencies did too, according to a letter released Friday by Christy Lopez, deputy chief of the special litigation section of the Justice Department's Civil Rights Division. He did so after Justice Department officials brought the issue to his attention, alerted by residents during community meetings earlier in the week who complained they had seen officers wearing the bracelets on patrol during protests Tuesday, according to the letter. "'These bracelets reinforce the very 'us versus them' mentality that many residents of Ferguson believe exists,' Lopez wrote. Lopez also urged the chief to ensure that his officers wear their name tags in keeping with department policy. Critics had noted officers were patrolling without them or with their names covered by black tape, according to the letter. 'Allowing officers to remain anonymous when they interact with the public contributes to mistrust and undermines accountability,' Lopez had written to Jackson in a letter earlier this week, also released Friday. 'The failure to wear name plates conveys a message to community members that, through anonymity, officers may seek to act with impunity.'" Isn't the first duty of any police officer to protect and serve the community? Exactly how is that to be accomplished if the officers openly support a killer cop and cover their name tags with black tape, Truthseekers? Clearly they're not interested in protecting or serving anyone but themselves. Scary. Let's hope these officers are never on the receiving end of one of those Defense Department giveaways where they hand over surplus armored vehicles and automatic weapons. Meanwhile, the parents of Michael Brown are less than thrilled with the videotaped apology they received from Ferguson police chief Tom Jackson. They feel he should be fired for the shoddy mishandling of their son's murder case. "The grieving parents of Michael Brown said they were unmoved by an apology made by the Ferguson police chief -- over a month after their unarmed teenage son was shot dead by an officer. Michael Brown's mother, Lesley McSpadden, called for Chief Tom Jackson to be fired, and his father, Michael Brown Sr., said rather than an apology, he would like to see Officer Darren Wilson arrested. "The couple gave an in depth interview to the Associated Press over their son's death after he was shot dead by a white police officer on August 9 and left in the middle of the street for hours. Brown Sr said: 'An apology would be when Darren Wilson has handcuffs, processed and charged with murder.' 'I don't want words, I want action,' Brown's mom added. In the video released on Thursday, Police Chief Tom Jackson apologized. "'I want to say this to the Brown family: No one who has not experienced the loss of a child can understand what you're feeling. I am truly sorry for the loss of your son,' Jackson said. "Police officers took more than four hours to remove Brown's body from the street after he was shot dead by Officer Wilson." Seems like everything is slow in Ferguson, except the trigger fingers. It took the chief a month to apologize for taking so long to remove their dead son's body in the street, where the shooter -- Darren Wilson -- paraded around the corpse for hours (as documented on multiple mobile videos). Sickening.